Spring is sprung and asparagus season has started here in Northern Italy! 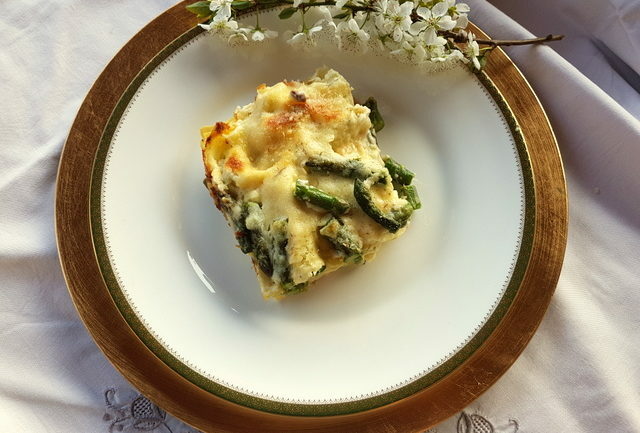 There are so many delish pasta with asparagus recipes but this poached salmon and asparagus lasagne al forno is one you are definitely going to want to try! It’s asparagus season and asparagus are everywhere here in Veneto. Fat or thin, green, white or purple, wild or cultivated, Northern Italians love asparagus. Italians have so many recipes for this spring perennial vegetable. 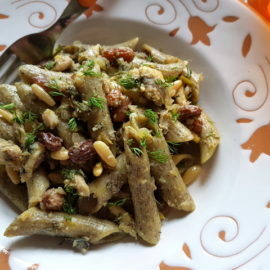 They steam or boil the asparagus and serve them with different condiments like Parmesan and butter, gremolata or even with capers and anchovies. They make asparagus frittata and crepes and asparagus risotto is practically a staple here this time of year. 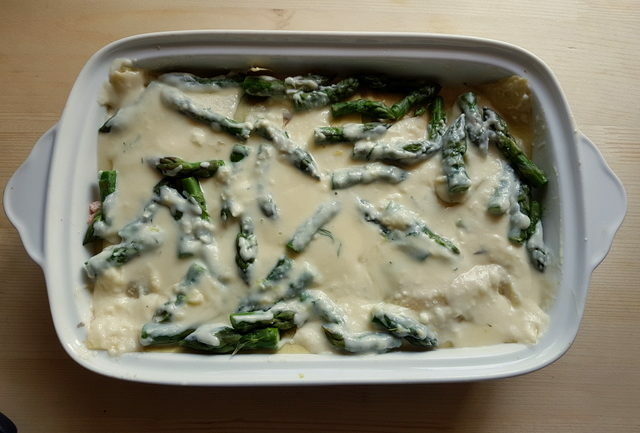 And, of course, asparagus find their way into numerous pasta dishes, like this to-die-for poached salmon and asparagus lasagne. 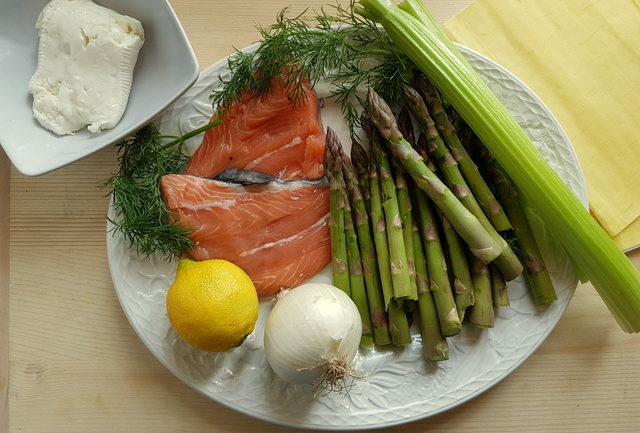 People have been eating asparagus since 3000 B.C. The exact origins of asparagus are hazy. Like many vegetables it originated as a wild plant (wild asparagus grow in many parts of Italy) . Certainly the ancient Egyptians ate them as they appear in Egyptian writings and the ancient Romans and Greeks loved them too! In fact the word ‘asparagus’ comes from the Greek ‘asparagos’ meaning sprout or shoot. The Romans are said to be the first people to cultivate asparagus.They ate them fresh in season and dried them for the winter.They also froze them! Apparently the Romans sent tons of these veggies high into the alps to freeze them for the feast of Epicurious and the Emperor Augustus even built ‘an asparagus fleet’ so that asparagus could be shipped all over the Empire! After the fall of the Roman Empire, asparagus lost popularity but began to be re-cultivated in Europe in the 1500s. Here in Veneto, asparagus fields abound. Italy is the leading producer of green asparagus in Europe and the third for white asparagus. There are some types of Italian asparagus which have DOP classification from the European Union, such as the white asparagus from Bassano del Grappa. The purple asparagus ‘Violetto d’Albenga’ from Liguria was the first type of purple asparagus ever to be developed. A recipe for those is waiting to be made, just as soon as I can get my hands on some of those tasty wonders! 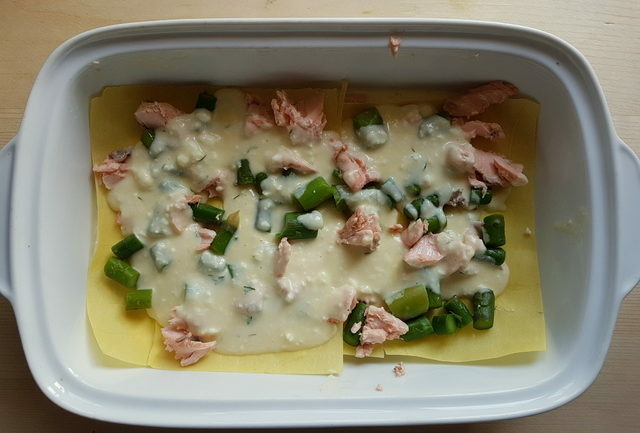 Poached salmon and asparagus lasagne recipe. Since I live in the region that cultivates the most asparagus in Italy, it’s not surprising that we eat so much here in the spring! 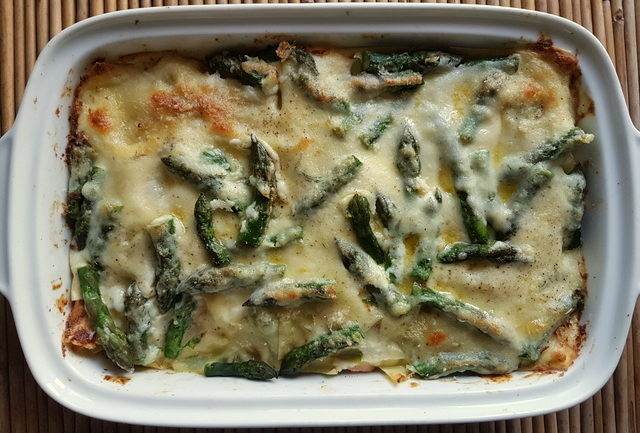 I love baked pasta so, when I was looking for an asparagus pasta recipe to post and saw this poached salmon and asparagus lasagne al forno, it was love at first sight! It was also love at first bite! 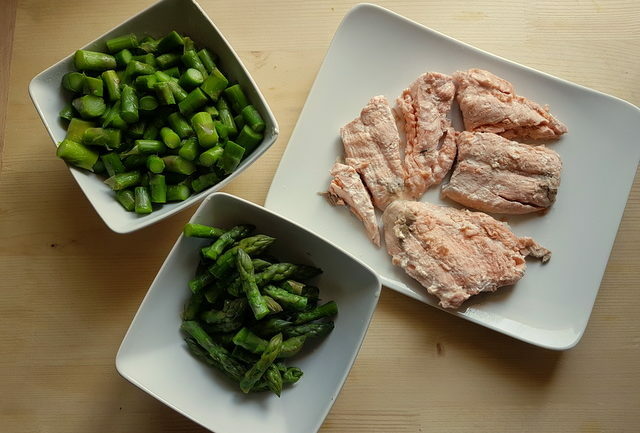 Asparagus and salmon are a delicious combination. I could have cheated with the salmon and used tinned, but I thought it’s never going to taste as good as poaching it myself! Obviously, tinned salmon would make this a much faster recipe. But, if you have the time, I’d definitely recommend poaching fresh salmon! Divinely delicious! 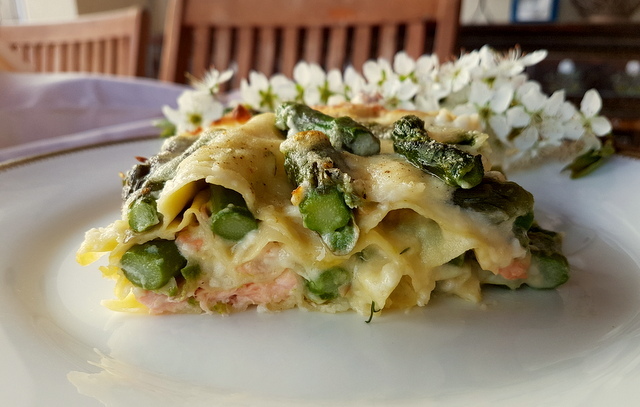 Like other baked lasagna recipes this poached salmon and asparagus lasagne requires a bit of work and needs to me made in stages. However, nothing takes very long. 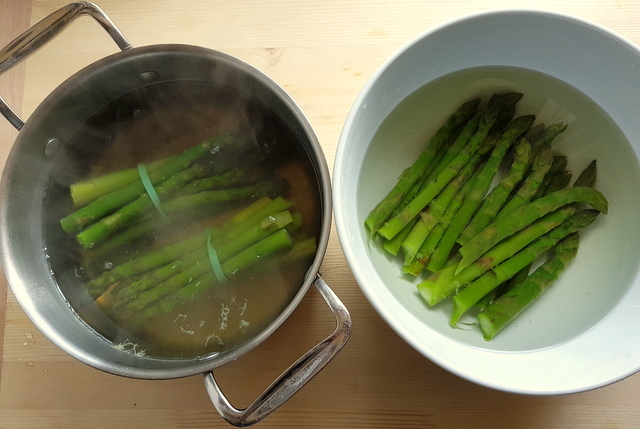 The asparagus can be boiled or steamed but they only need 5 minutes. 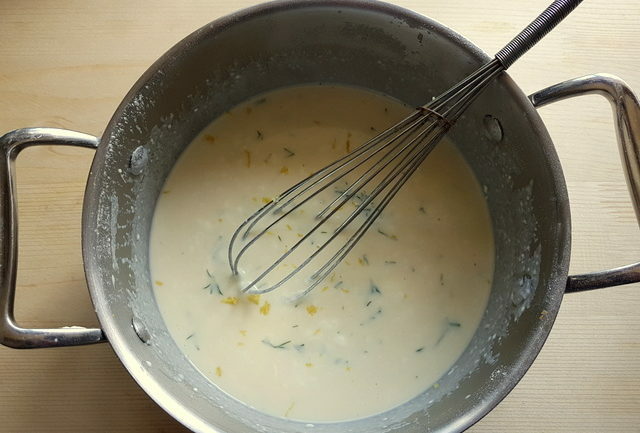 Poaching the salmon takes about 20-25 minutes and making the béchamel not even ten! I used fresh lasagne sheets and didn’t precook them. 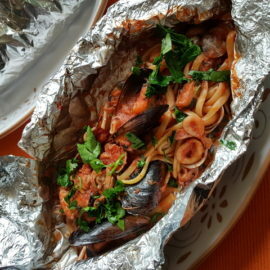 If you use dried pasta then you’ll need to par-boil the sheets beforehand. Don’t forget to keep them very al dente as the pasta will finish cooking in the oven. Then just put it all together and bake for about 25 minutes. 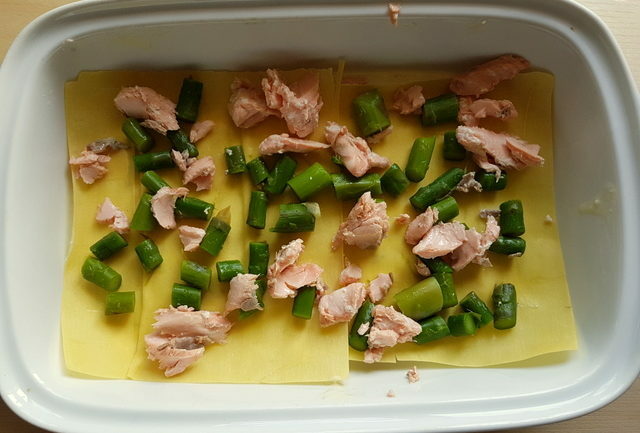 We had this poached smoked salmon and asparagus lasagne for dinner last night and the first thing I wanted to do this morning was share the recipe here. I have some other recipes I have made which are on my list to be posted, but this one had to jump the queue! I’m sure if you try it you’ll understand why! 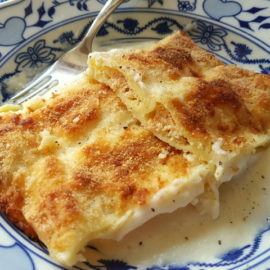 Can I make poached salmon and asparagus lasagne a few day ahead ,can I freeze it, Thank you for the delicious recipes. 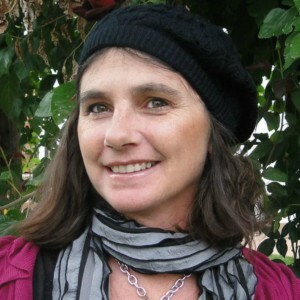 Hi Victoria! I’m happy you like my recipes! I think you can freeze this lasagna but I have never done it, so am not sure how good it will be from frozen. However, lasagna is one of the few pasta dishes I do freeze even if I have never frozen this version. Best to cook from frozen rather than let it defrost as the pasta can become soggy! Some Italians would say that you NEVER serve a seafood dish with cheese. I believe that we should eat what we like and let others eat what they like. I will try this recipe WITH the cheese, thank you very much! 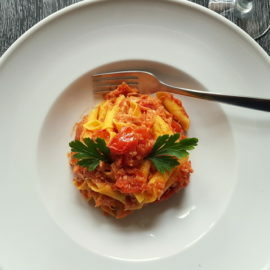 This is such a unique take on lasagna! It looks and sounds absolutely delicious! I am yet to try asparagus, sounds weird right?. The lasagna looks so creamy and tasty for a nice and filling dinner. I don’t eat fish, but it still looks really tasty! Do you think I could use some other meat other than seafood? You can never go wrong with salmon, and all the flavors in this look spectacular!